Americans have always cherished their flags. Flags are passed down from generation to generation. An official American flag is always official, and can be flown proudly at any time. They are never retired or become obsolete. Unlike today, where people routinely visit their local hardware store and simply purchase a new, mass produced American flag once their current flag becomes damaged or unserviceable, early American flags were often repeatedly repaired and updated over years or even decades of use. 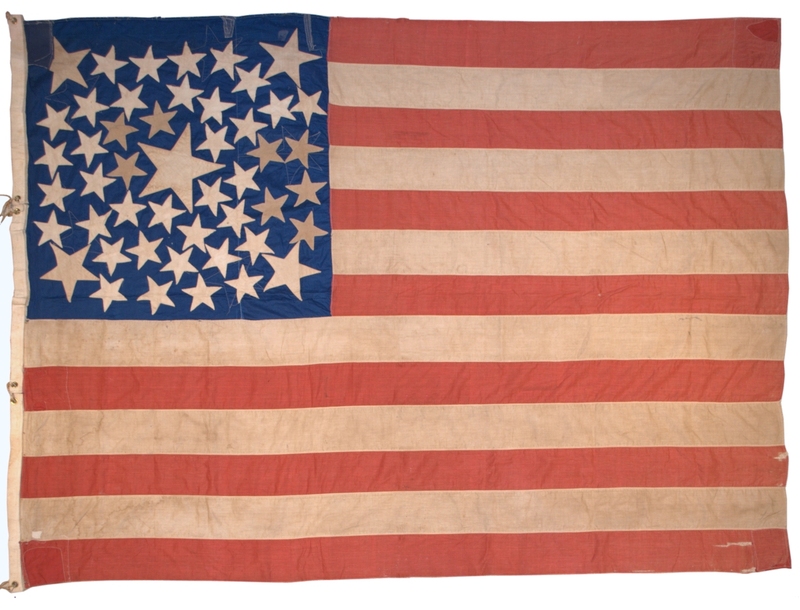 More often than not, antique American flags show evidence of repairs. I suspect this is because the fact that these flags have even survived is indication that those who cared for the flags over generations were also those most likely to make repairs to their flags in order to ensure their survival. Some flags show evidence of being repaired over and over. These repairs are more than just a curiosity. They add tremendous character to these antique flags, and more importantly, they are the personal handiwork of those generations past that made these flags and their descendents who continued to cherish them. The nature of the repairs depends on the type of material from which the flag is constructed, and the type of damage the flag has sustained. 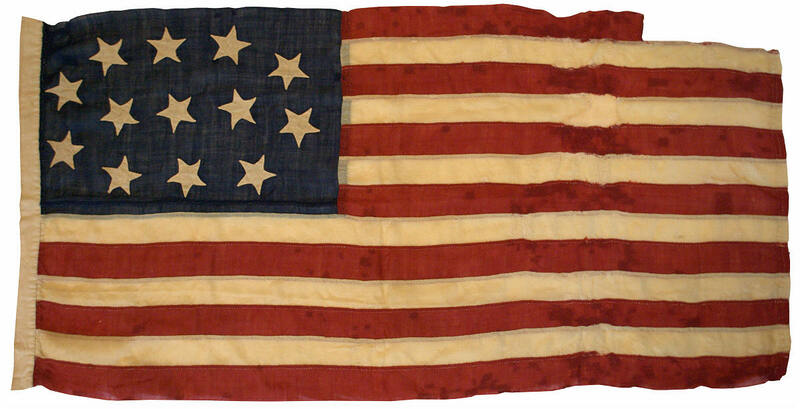 Below are some common examples of repairs made on various types of antique American flags. Darning of a Wool Flag, circa 1845. 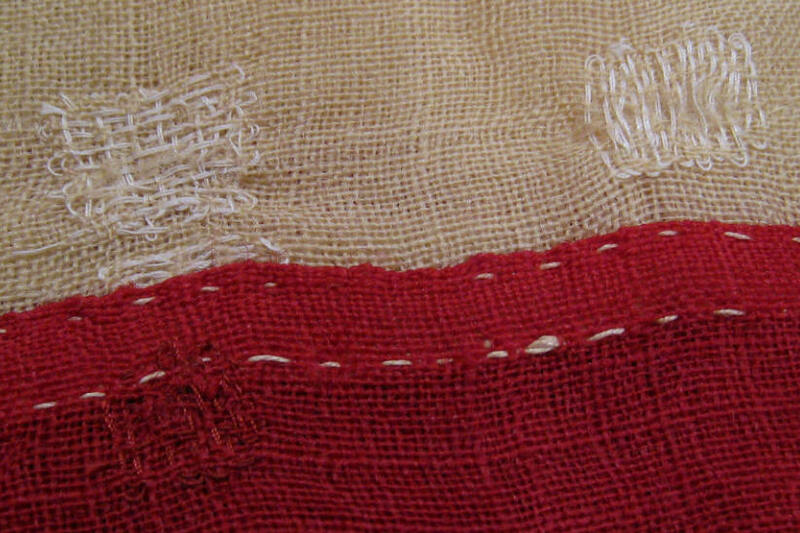 One way of repairing holes in wool bunting is the technique of darning. To make the repair, thread is woven through the existing fibers of the wool fabric creating a hand-made fabric weave that closes the hole. The process is very laborious, but the repairs are strong and lasting. Look closely at the large photo of this very early American flag. The areas of the red and white stripes that look discolored are actually not discolored. They are areas of literally hundreds of very small darned holes, made with thread selected to match the original fabric of the flag. Patching, Early 20th Century. Here we see areas of patching and reinforcement to the one corner of this early 20th century 48 star flag. In each of the corners of this flag there are patches applied, and in some cases, patches on patches, with combinations of machine stitching and hand stitching, evidence that the flag was lovingly cared for over many years. 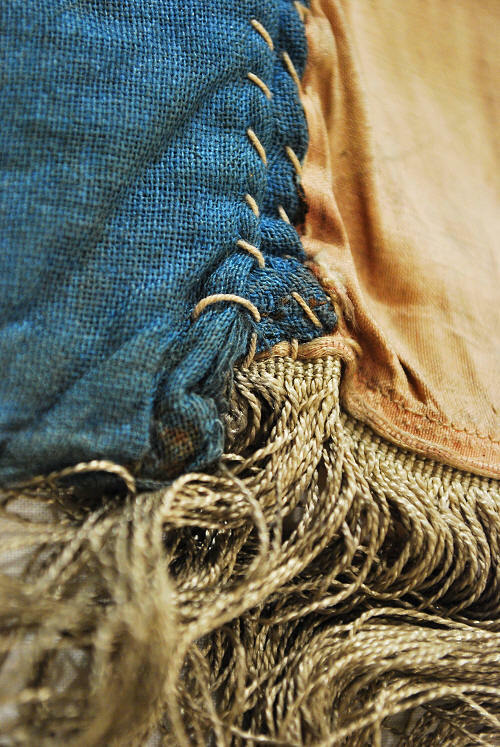 Re-stitched Split Seam, circa 1861. 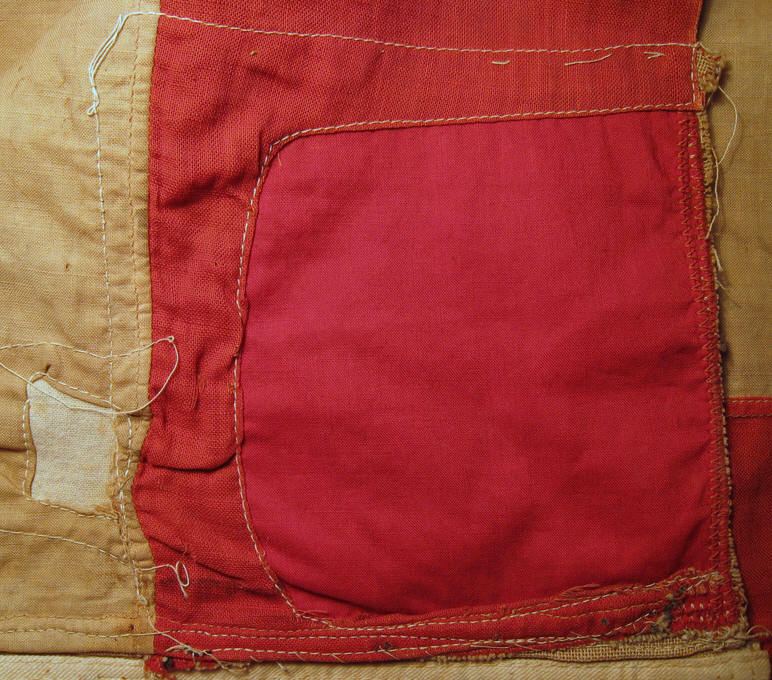 This close up photograph shows a hand stitched repair made to the seam where the sleeve hoist of this flag attaches to its bottom red stripe. In stitched repairs, no replacement fabric is added to the flag. Instead, the split is simply rejoined. 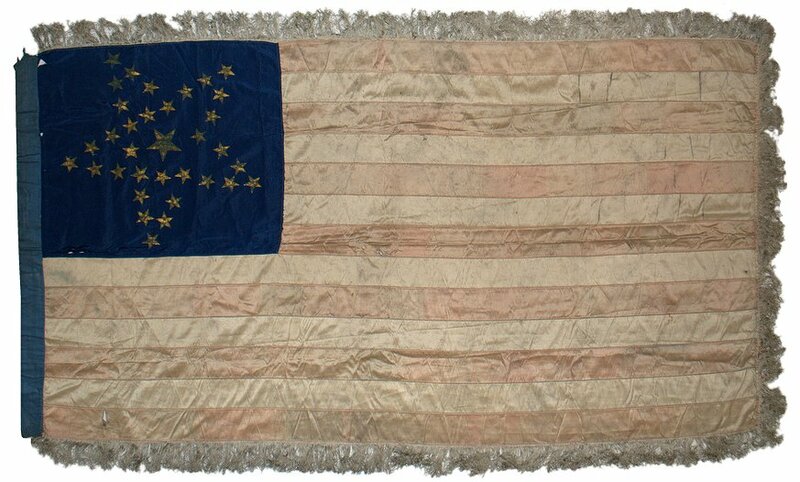 This particular repair on this particular flag, the battle flag for Company L, 102d Pennsylvania Volunteer Infantry, is especially touching in that it was most likely made by a Union soldier, perhaps the unit color bearer, while the flag was carried in the field during the Civil War.